Anton Ferdinand becomes the latest established Premier League player to join us here at Loftus Road. 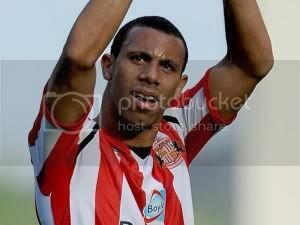 Ferdinand has cost the R's in the region of £4 million from Sunderland and has signed a 4 year deal. Ferdinand exploded onto the scene at West Ham as a youngster and played his part in a fantastic centre back partnership with current QPR defender Danny Gabbidon. Ferdinand fell out of favour and joined Sunderland when Steve Bruce was looking for defensive reinforcements but again Ferdinand found himself fall down the pecking order when Michael Turner and John Mensah forged a good partnership together. "The Club's moving forward and things seem to be buzzing around here at the moment. "I came down from London on Wednesday and spoke to the gaffer, and was impressed with his thoughts on where the Club is going to go. "I've heard good things about the Manager and, after speaking with him, it's clear that he wants the best for me and wants me to do well. "As soon as I came out of the meeting with him, I knew that QPR was the Club for me." Welcome to QPR Anton, we wish you all the best during your time here at QPR! R's on the Road.............. To Everton.